Modern Classics is the first independent, critical assessment of the original drinks of these recent decades, compiled by New York Times drinks writer, journalist and author Robert Simonson. This brutally honest collection identifies, justifies and presents the authoritative, verified and properly attributed recipes in four categories: the modern classics, the objectively popular drinks that might yet achieve that status, certain drinks identified as critical favorites worthy of more attention, plus a collection of foundational recipes from the 1970s, 1980s and 1990s that helped set the stage for today’s cocktail renaissance. - 99 meticulously researched recipes—full list of included recipes available on web site—to be gradually expanded in the future, as appropriate - The best of the best - Search recipes by base spirit, cocktail-type and date of creation - Check off the ingredients you’ve got and this app will show you which drinks you can make - Filter the recipes on multiple criteria with just a few taps - Flag recipes and tag favorites; create custom lists of recipes - Annotate recipes with comments and cumulative likes and dislikes and build up a chronological history of your explorations - Ingredient definitions included - Sync your ingredient inventory, favorites and flagged, custom lists and journal entries across our entire suite of apps and over as many iOS devices as you like, using our free sync service - Universal app, works nearly identically on both platforms Please enjoy responsibly. It’s like having a great recipe book at your finger tips at all times. 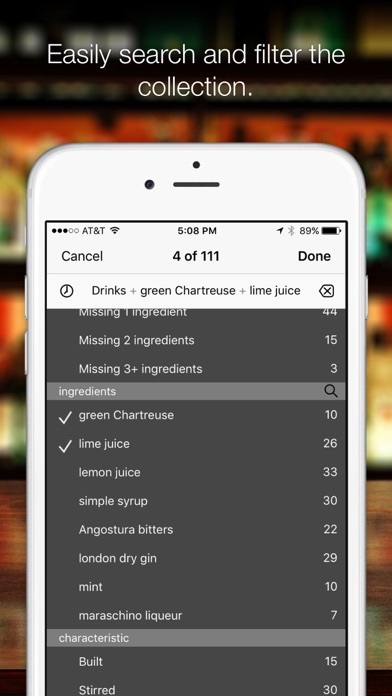 Reliable recipes that make delicious drinks, and the integration with the other apps from Martin Doudoroff is outstanding. I can't recommend his apps highly enough. I would much rather have an app with a well-curated selection of high quality recipes, than an app with thousands of cocktails of questionable quality. Moreover, the app is well thought out, with extremely useful features. I've even e-mailed Martin a couple of times and immediately received friendly and helpful responses. I've purchased three of his apps and expect to add another 2 or 3 fairly soon. After using these apps, I don't want to use anything else. I know I'm gushing, but they are honestly that good. 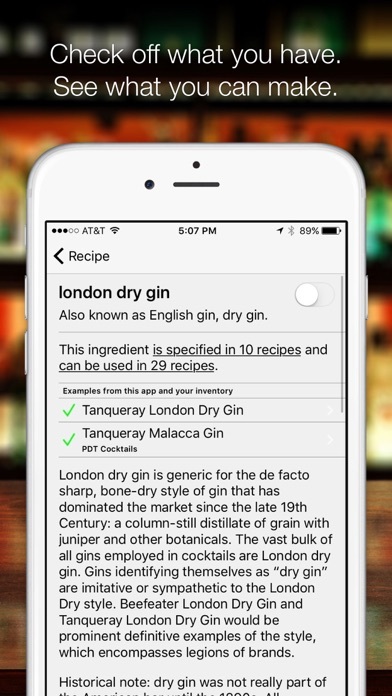 The design of this suite of apps is perfectly suited to the at-home cocktail enthusiast. 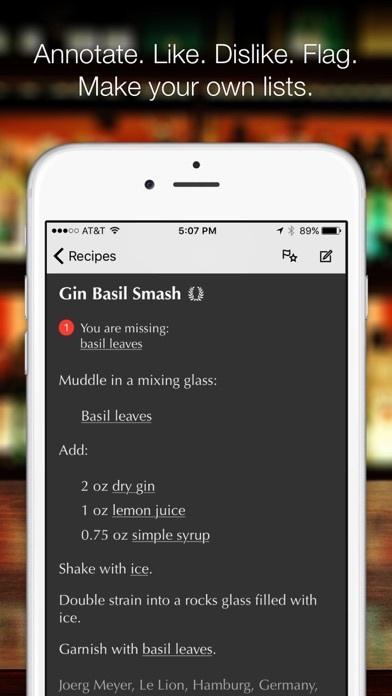 Input your ingredients once, sync to all other apps (easily authenticating via 1Password support), flag recipes, and drink lovely cocktails. I'm a particular fan of flagging recipes I want to try because the list of flagged recipes shows you results from all installed apps in the suite. Very easy to find a good one to try (likewise with favorites). This particular collection reads like a list of personal favorites and great memories if you've been enjoying the cocktail scene develop over the years. Well worth the price - I will get frequent and happy use out of this (as will many guests to my house)!! Same format as the PDT & Beachbum Berry cocktail apps but with much less content. As of Sept. 2016 it contains 102 cocktail recipes and most are already in the PDT app. Not worth the price, but hopeful future updates would make this app worthwhile. 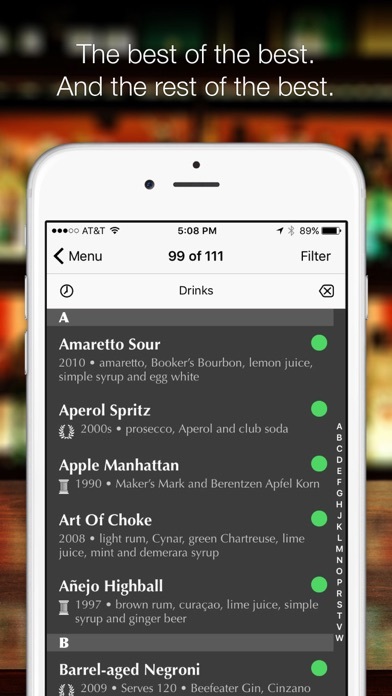 This is a great cocktail app (as are all of Doudoroff's other cocktail apps). 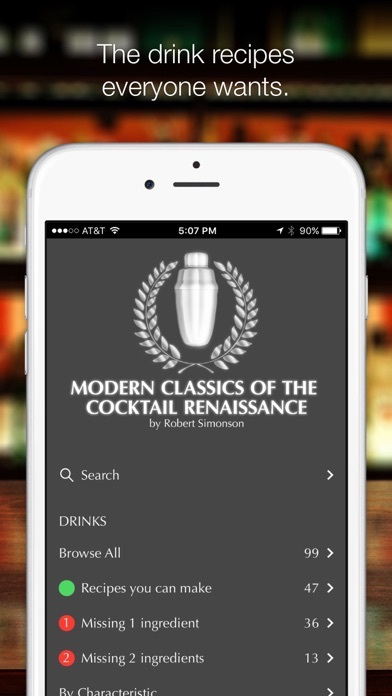 This particular app, as its name suggests, has handpicked modern classics with detailed recipes and a description of the history of each drink. I am still working through all the cocktails but the ones I've made so far are extremely delicious. I highly recommend the app. A previous reviewer unfairly suggested that this app is a repetition of the PDT app also created by Doudoroff. I have both apps and I can assure you that isn't the case. A few of the recipes in PDT (the ones that are considered "modern classics") are also in this app but the overlap is minimal. Also in the past I have emailed the developer with questions or suggestions regarding app features and he always responds promptly. So many great cocktails from innovative bartenders all in one place. If "rogue cocktails." or "beta cocktails." had gone on to be an app, it might have looked a lot like this.